US Secretary of State Mike Pompeo said that the US delegation attending a regional security forum in Singapore delivered a letter from US President Donald Trump for North Korean leader Kim Jong-un on Saturday. “Our US delegation also had the opportunity to deliver @Potus reply to Chairman Kim’s letter,” Pompeo said in a tweet after attending the foreign ministerial meeting at the ASEAN Regional Forum. The reply to Kim’s letter was delivered after the White House had announced Thursday that Trump had received a new letter from Kim and had responded quickly with a letter of his own. 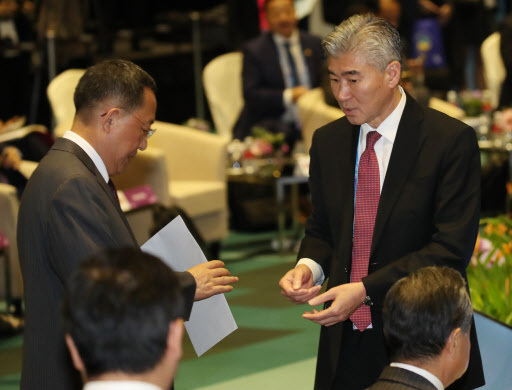 At the opening of the meeting, Sung Kim, the US ambassador to the Philippines and the State Department‘s top Korea expert, was seen delivering a gray envelope and explaining something to Ri, raising speculation over what was inside the envelope. Sung Kim, who has working-level talks to set the agenda in preparation for the historic summit between the US and North Korea in June, is a member of the US delegation to the ARF. He had a meeting with South Korea’s nuclear envoy Lee Do-hoon on the sidelines of the ARF on Friday. In the tweet, Pompeo also said he had the chance to speak with his North Korean counterpart Ri Yong-ho and had a quick, polite exchange. The top diplomats encountered each other and shook hands with a smile at the opening of the meeting. Hopes are rising that the delivery of the reply could lead to a breakthrough in follow-up talks between the US and North Korea. A lack of visible progress on North Korea’s denuclearization, coupled with reports of North Korea’s continued missile production and evasion of sanctions, intensified skepticism over its commitment to denuclearization. On the sidelines of the ARF, Pompeo stepped up calls for strict enforcement of international sanctions against North Korea, calling it key to achieving the goal of the “final, fully verifiable denuclearization” of North Korea amid slow progress on disarmament. All eyes were on whether Ri would meet Pompeo or his South Korean counterpart Kang Kyung-wha for formal bilateral talks on the sidelines, as the countries are engaged in negotiations to denuclearize the Korean Peninsula. But the meetings did not materialize. Ri turned down South Korean Foreign Minister Kang Kyung-wha’s offer of a bilateral meeting, according to South Korean officials. Pompeo was also willing to hold talks with Ri, but he is not thought to have been contacted. Ri, however, is believed to have held meetings with his counterparts from China, Laos, Cambodia, Australia and New Zealand. Ri was set to leave Singapore later in the day. The Saturday session of the ASEAN Regional Forum brought top diplomats from 26 countries and the European Union for talks on political and security issues in the Asia-Pacific region. The ARF has often been a rare venue for the North to interact with other countries.